Daphne's Diary is for the woman who loves antiques, vintage, romance and nostalgia. She is creative and loves home decorating and gardening. Within its gorgeous pastel coloured pages, Daphne's Diary introduces readers to the very best and most stylish interior design ideas, gardening tips, recipes and more. The eponymous Daphne takes readers by the hand throughout each issue, imparting advice and ideas in a friendly and personable style that is unlike anything else available on the shelves. Whether you're looking for inspiration or just like to keep ahead of the curve, you should be sure to keep Daphne's Diary close to hand. Free gifts such as colouring books and craft kits are also a frequent addition to Daphne's Diary, ensuring that the magazine is becoming the latest essential read for anybody who loves to see all the latest in quirky home trends, textiles and styles. 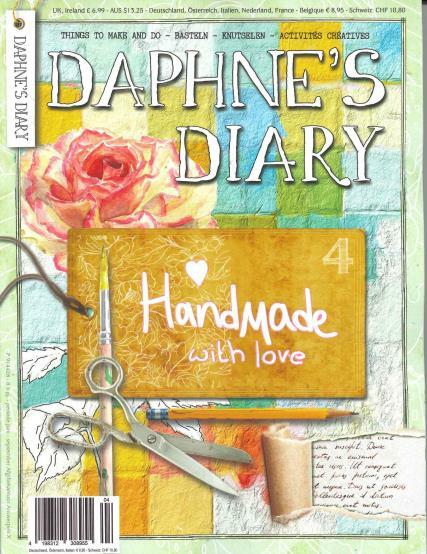 Daphne's is one diary that everybody is encouraged to read. I always look forward to receiving my edition every time its due out ,its an amazing mag always plenty to do and make ,and we share it ,my granddaughter as the recipes ,the stories i put into scrap books to keep and making things i just love doing .many thanks . I got my first issue and absolutely love this magazine, full of great ideas and inspiration. Brilliant so much fun with so many ideas in every issue and lots of projects to do. Fabulous magazine, crammed with bits to read and things to do. I love receiving it in the post, it’s a real treat. Like this magazine. But some bits of it have disappointed me lately. Brilliant magazine! I love getting it through the post and look forward to it arriving. Excellent, all the most interesting subjects that I like read and do. Beautiful magazine with amazing colourful content. A joy to read on lovely thick paper. I love my Daphne’s diary’s! It’s a beautifully designed diary and very unique! I love receiving it each issue and will definitely keep up my subscription so I don’t ever miss one, I love that it’s so different in each issue and that there is so many things to do in each copy. I had seen a lot of reviews online for this magazine and wanted to try it out myself as it looked a bit different to other magazines. It was exactly as I expected, lovely with really nice artwork/designs that can be used in a lot of different projects. Beautiful magazines with lots of ideas, resources and pictures. Always eager to get the new issue so i can get creative. My wife is delighted with the magazine and looks forward to each copy. I love this magazine. It has so many of my interests and hobbies in one place. I got most of the issues from last year too. My daughter and I love the ideas provided and following the tips for producing enjoyable craftwork. I also like to read the inspiring stories of how other's got started. I enjoy the magazine very much.interesting places to visit and tour, practical crafts, cooking new ideas and stories, very uplifting. I love everything in this magazine it has all my favourite things to do after I have finished it I pass on to my daughter who gets equally as much satisfaction from it. Love this magazine. So diverse from others on the market. It's like sitting down with an old friend. The Best magazine in the world! Love the crafts side of it. My first one was given to me by a friend, so I immediately shared it with another friend, we are now BOTH hooked. Have bought may beautiful mags before in my life but Daphne's Diary is just gorgeous; top quality paper, illustrations (that I want to practice painting), stories (like hearing them from an old friend), crafts, ideas, little "gifts" and giveaways all done in the sweetest most lovingly personal manner. Worth buying just one copy to see if it suits you, great to read, cut pieces out of or just keep to read again and again. Don't know if I will be able to throw mine out! I love this magazine so much! I wish it were readily available here in the States. But shipping from Unique was so quick, will definitely order from here again. I love this magazine..It's so beautiful..no advertisements...every page is gorgeous! It's the best creative magazine on the market. The best quality of work inside. I love it from front to back. I really love the illustrations in the magazine and use them in my art journaling. I don't always read all the articles but enjoy those I do. I love everything about this magazine. It is such a fun magazine with beautiful things to see and do. Inspiring crafts! Beautiful magazine. Packed with gifts/crafts. Almost too lovely to take the things out to use. Absluty gorgeous magazine I think it's the best on the market out of all magazines.. I highly recommend it to everyone. I purchased No. 1 issue for 2017 at my local pharmacy yesterday & am so pleased I have already read it cover to cover. Articles are great-especially Kew Gardens-I am planning a trip to England hopefully by 2018. Craft ideas & recipes are great! Even the quality of the paper is a cut above the magazines I can buy here in Canada. Keep up the good work, I want to buy every issue! Only had one magazine so far but I read every page, not something I can say about other magazines! Loved it! Daphne's Diary is an absolutely gorgeous magazine. Each page is beautifully presented, and the quality of the paper, photographs and the artisans creations are of the highest quality. It is a real joy to find every new issue waiting for me at my newsagent. The most beautiful magazine ever, I spend hours pouring over each page of this wonderful magazine, every issue issues just a joy to behold. ... breathtaking! It is unique and entertaining, it is becoming repetitive in content. Completely different from all the others. Beautiful to look at and inspiring. Love the magazine! Well done. Alot of variety! Love the freebies for your own diary! Love Daphne's Diary. Always fun treats in here. Love Daphne's Diary. It's so cute and whimsical. Lots of goodies. I love this magazine! It is so beautiful to look at with a cup of tea! It gives me inspiration. To me this magazine is like a guilty pleasure, I just love it. Originally I had terrible trouble getting hold of a copy but solved that by subscribing. The joy of the artwork, verses, stickers and quality of paper etc.is wonderful my only complaint is that what could be a lovely cut out complete page sometimes has text on it! Oh well.... When the 'book' arrives everything stops and I sit with cup of coffee and relax..... aahhh, lovely. Thanks for a beautiful and different periodical. It is such a rare pleasure to find this magazine when I do. Barnes and Noble, if I am lucky and our timing is impeccible I find the last 1! With fewer brick and mortar bookstores here in the US, especially where I live; its when I have a surgeons appointment that I am able to stop in to B&N hope to find. Ive ordered Daphnes actual diary/planner for 2016 and loved it so much had to get it for 2017. Smaller, compact than the previous version, still stunningly creative and wonderful. EVERYTHING is beautiful, makes my creative heart smile. So, since getting my hands on the magazine has proven difficult ive been promised by family a subscription! I am thrilled and excited at the prospect. Every bit of every magazine can be used in so many fantastic ways. After reading, learning, being inspired - journaling, stickers, prints for framing, wrapping paper, mixed media...just so much to ehat meeta the eye. HIGHLY recommended this publication and ALL of her products, ive not seen anything else like it anywhere else. Love this magazine. There is something in it for every part of me. Honest, true, beautiful and creative. My new favourite way to Wyler away the hours. A feast for the eyes, the imagination and the senses. Almost magical. Great magazine to be inspired with positive vibes anb ideas...wonderful art work. Absolutely love this magazine! I look for it every time I visit the newsagents! Love this creative inspiring magazine.